Are you a kitchen dancer? Certain songs are just made for dancing around your kitchen, singing at the top of your lungs – mainly those with lyrics that are total nonsense. Do wah diddy diddy dum diddy do? Mama say mama sah mama koo sah? Su su sudio? Galileo Galileo will you do the fandango? Whatever Snow is saying in that song Informer?? 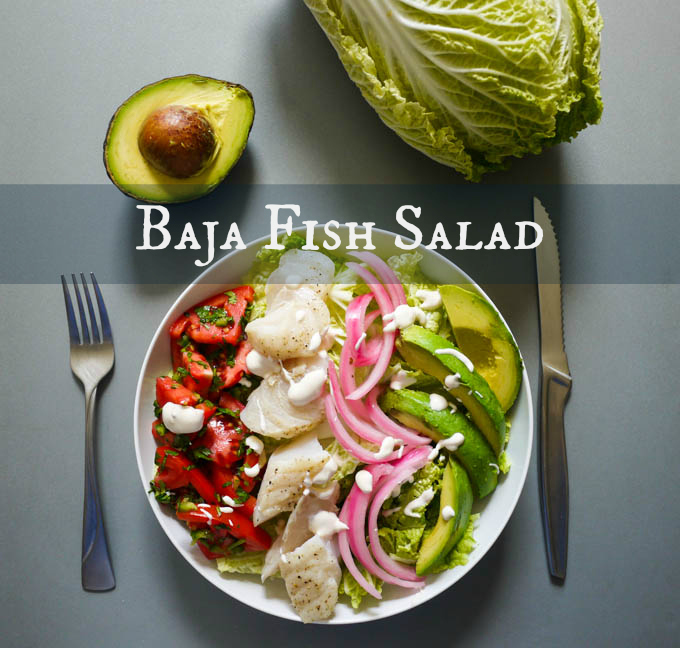 This, super easy, Baja Fish Taco Salad is perfect for turning on your favorite nonsense lyric song, singing wildly into your carrot microphone, and still putting something really impressive on the dinner table. Other than baking the fish, it’s basically an assembly job. Also, whyyyy have I not been broiling my fish this whole time?!?! It is so simple and amazing! 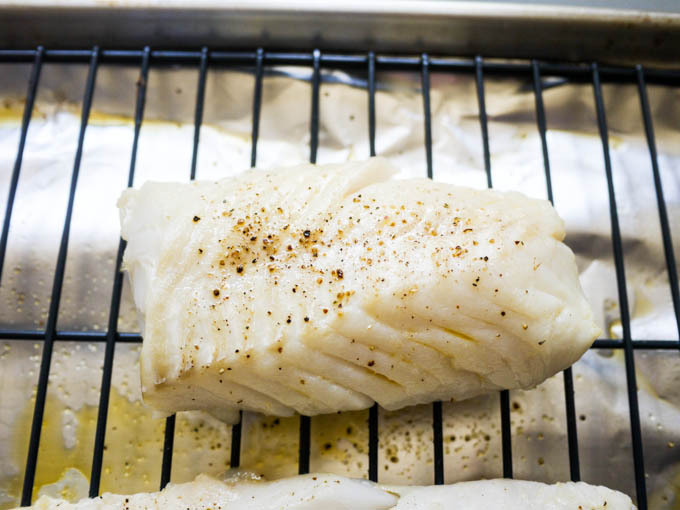 Salt and pepper your cod and place it on a foil-lined baking sheet. 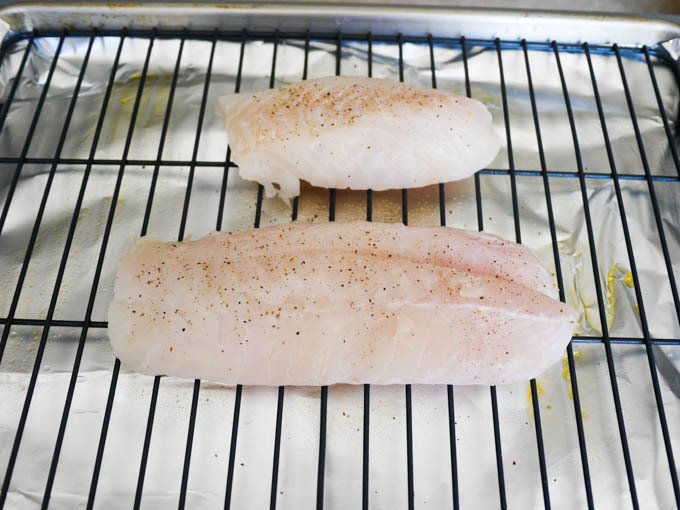 Broil the fish for approximately 10 minutes, until the fish flakes easily. When you pull it out of the oven, you should see that the fish has already started to separate into nice juicy chunks. 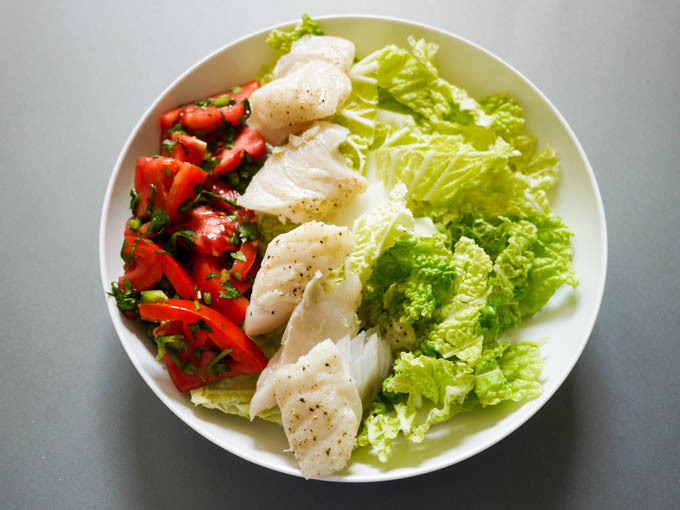 While the fish is broiling, assemble your salad. 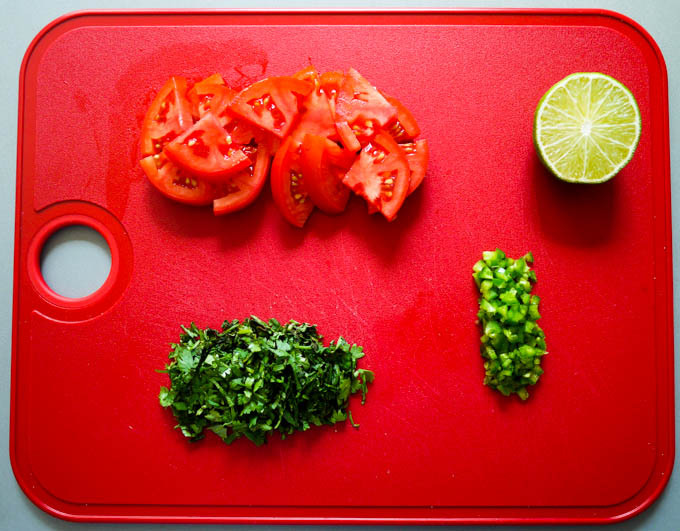 Prepare your tomato, jalapeno, lime and cilantro. 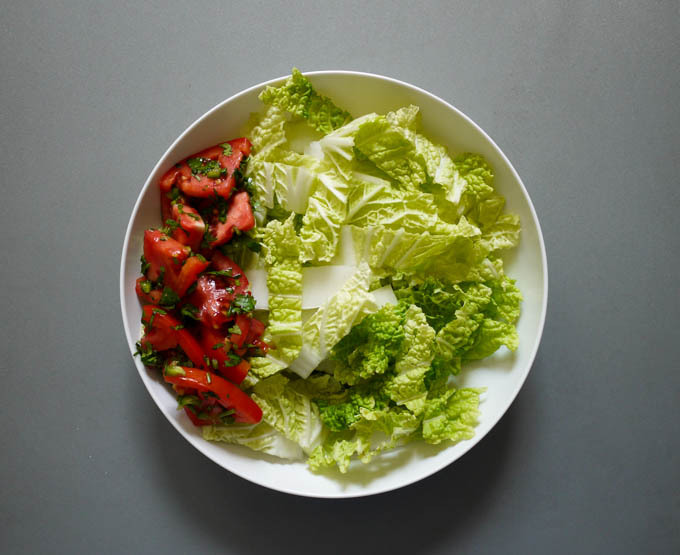 Combine in a bowl so the flavors start to meld into a quick salsa. Combine sour cream and hot sauce. 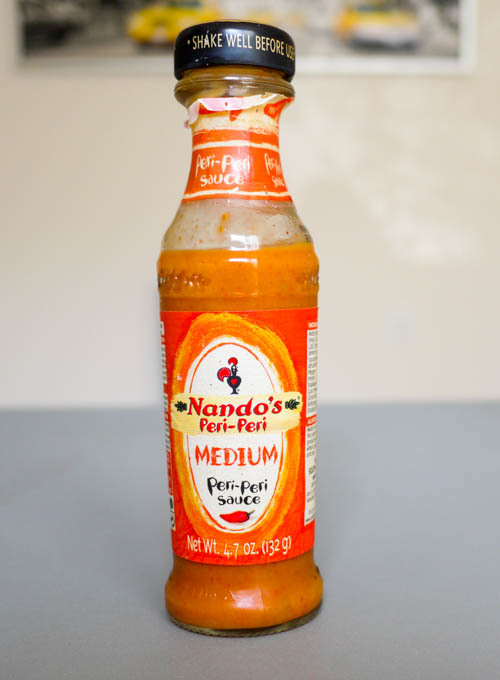 I’m using Nando’s Peri-Peri Sauce, but you can use sriracha, Frank’s hot sauce, jalapeno tabasco or whatever else you have on hand. 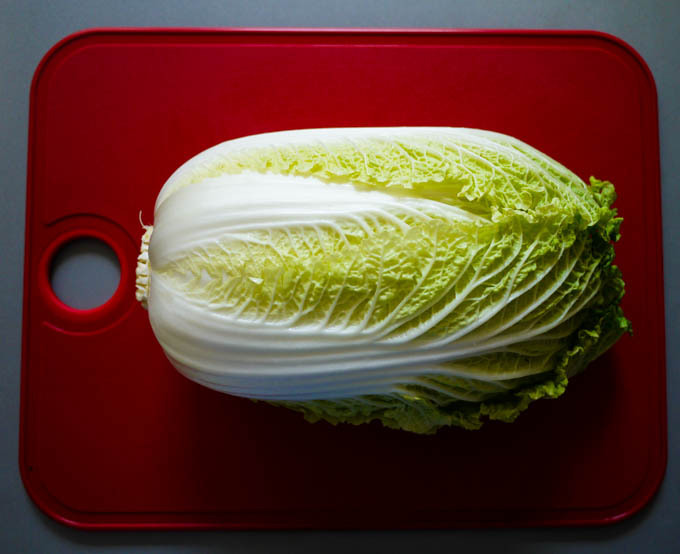 To serve, fill a bowl half way with napa cabbage. 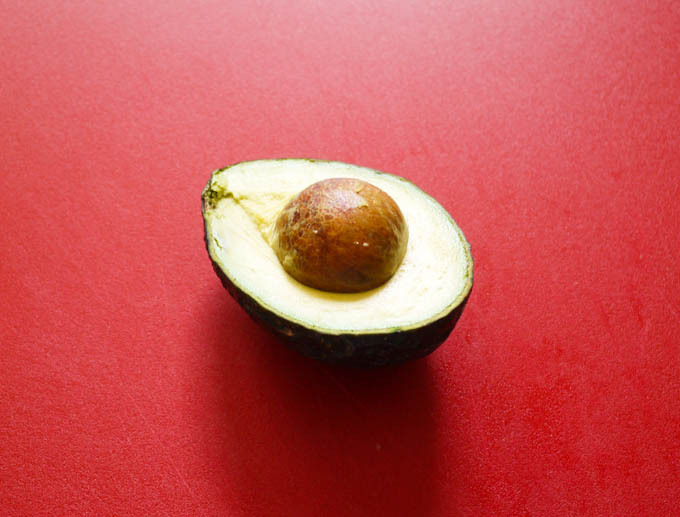 and a row of avocado slices. 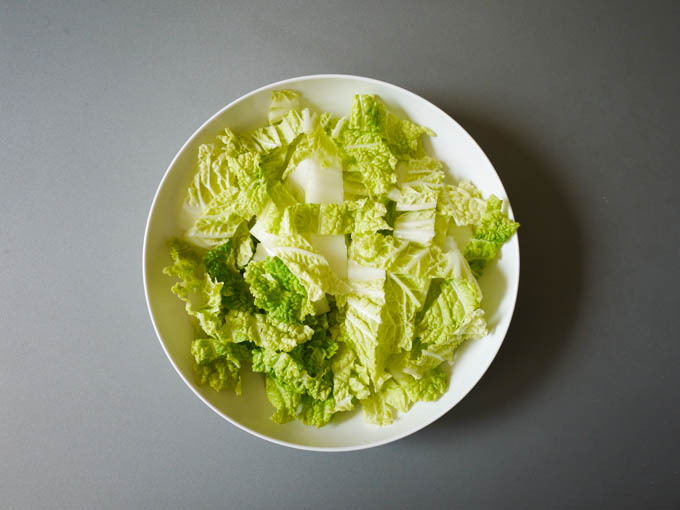 Drizzle with sour cream dressing and enjoy! Baja Fish Taco Salad with crunchy napa cabbage, broiled cod, quick tomato salsa, sliced avocado and spicy sour cream dressing. Broil the fish for approximately 10 minutes, until the fish flakes easily. When you pull it out of the oven, you should see that the fish has already started to separate into nice juicy chunks. 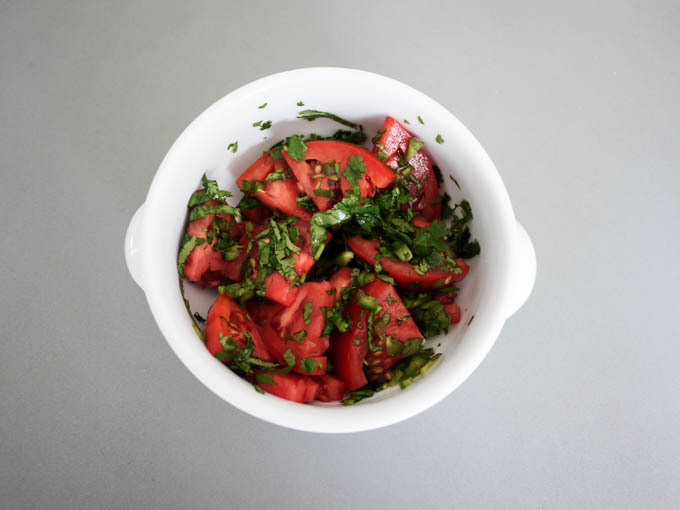 Combine your tomato, jalapeno, lime and cilantro in a bowl so the flavors start to meld into a quick salsa. Combine sour cream and hot sauce. 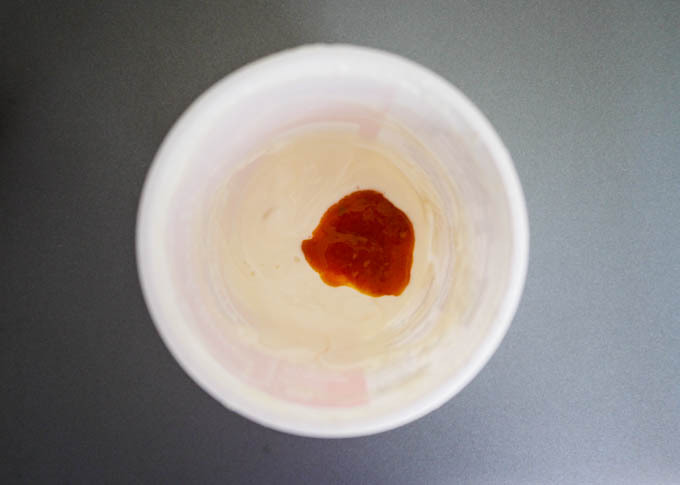 I'm using Nando's Piri Piri Sauce, but you can use sriracha, Frank's hot sauce, jalapeno tabasco or whatever else you have on hand. 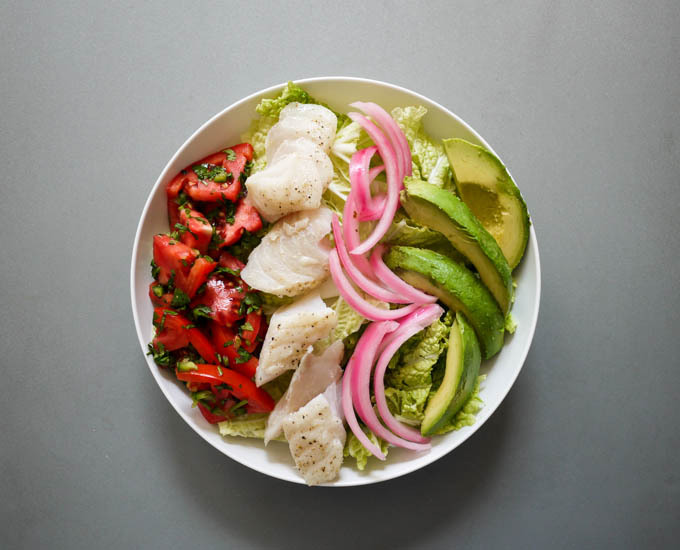 Top with a row of the tomato salsa, a row of flaked fish, a row of pickled red onions, and a row of avocado slices. 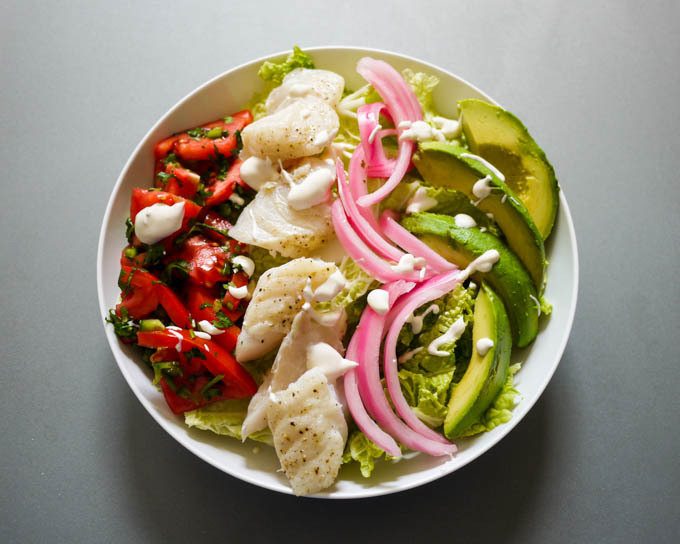 What a great recipe for a delicious and healthy weeknight meal. I definitely will be making the recipe, thanks for the idea! 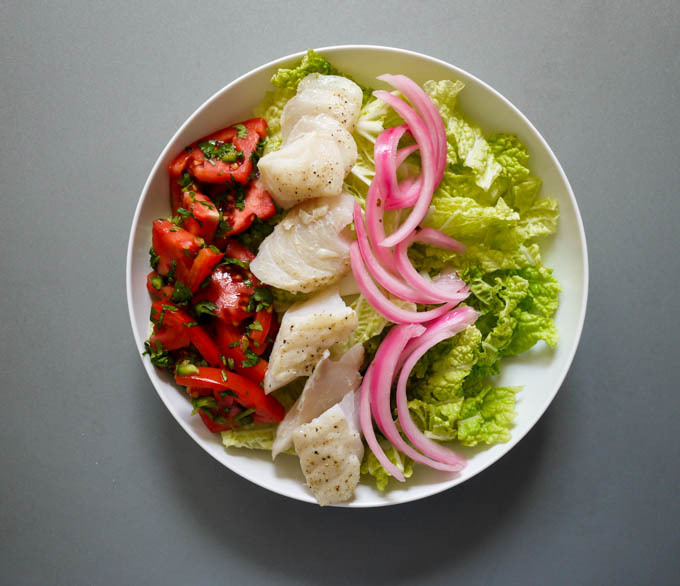 I love fish salads and I love that you used Nando’s sauce (I am obsessed!). I am definitely going to try this recipe when I can. This looks so divine, will definitely give this a go!